BUJUMBURA, BURUNDI, March 22, 2019 /EINPresswire.com/ -- Merck Foundation, the philanthropic arm of Merck KGaA Germany will organize the first “Merck Foundation Health Media Training” on 20th March 2019 in Bujumbura, Burundi in partnership with H.E. DENISE NKURUNZIZA, The First Lady of Burundi and Ambassador of Merck More Than a Mother together with Ministry of Health and Ministry of Communication and Media to break the stigma around infertility in Burundi and rest of Africa. The training program is a part of ‘Merck More than a Mother’ community awareness Program and is being organized for the first time in Burundi for local media representatives. “I am delighted to initiate this important training session as I strongly believe that media plays a significant role to influence our society to create a cultural shift. It has the capacity and ability to break the stigma around infertility in the community”, explained Dr. Rasha Kelej, CEO of Merck Foundation and President of Merck More than a Mother. The training will be addressed by the First Lady of Burundi, H.E. DENISE NKURUNZIZA, who is also the Ambassador of Merck More Than A Mother and Dr. Rasha Kelej, CEO of Merck Foundation and President of Merck More Than a Mother and Hon. Frederic NAHIMANA, Minister of Communication and Media, Burundi. It will also be addressed by stalwarts of Media and top Infertility experts. It will also provide a great opportunity for the journalists to meet the experts and also to network with each other and work as a unit to eradicate the stigma around infertility in Burundi and rest of Africa. It will be attended by journalists working for Print, TV, Radio and Online media. “The Merck Health Media Training program will focus on the international standards and media ethics for reporting sensitive issues like infertility in Africa. It is designed to benefit the journalists in understanding the infertility issues in African communities and to learn the best media practices to cover such issues.” Dr. Rasha Kelej added. “The Merck Health Media Training program will focus on the international standards and media ethics for reporting sensitive issues like infertility in Africa. It is designed to benefit the journalists in understanding the infertility issues in African communities and to learn the best media practices to cover such issues”, explained H.E. MADAM DENISE NKURUNZIZA, the First Lady of Burundi. Merck Foundation also announces Call for Application for “Merck More than a Mother” ‘Media Recognition Awards’ for Burundi and rest of Africa. The “Merck More than a Mother” ‘Media Recognition Awards’ were launched in 2017 with the aim to emphasize the role of media in enhancing the public engagement and understanding of infertility stigma and the need to change its social perception in African communities. The applications are invited by media professionals to showcase their work to raise awareness about infertility prevention and breaking infertility stigma in Burundi and rest of Africa. Who can apply? Journalists from print, online, radio and multimedia platforms from Burundi and rest of Africa. Last date of submission: Entries can be submitted till 30th June 2019. Merck Foundation conducted a ceremony to announce the winners of the ‘Merck More Than a Mother’ Media Recognition Awards 2017 in Nairobi, Kenya. 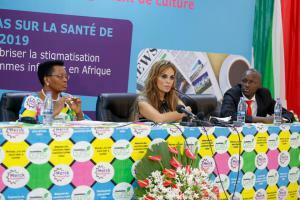 The ceremony was attended by over 200 journalists from 17 African countries.